My first memories of fruit butters are driven out of Carbondale, Illinois, which seemed worlds away from the Chicago suburbs, both in station-wagon miles and in accent. Maybe Aunt Harriet’s slower cadences and shifts and drawls reinforced her patience for hours and hours of bubbling the moisture out of the orchard’s apples and peaches. All I know is that my first attempts about 12 years back, trying to cram the process into a few precious free hours between business trips, were miserable failures that tarred at least one pot so thoroughly it went straight into the trash bin. The key, I now know, is to take things low and slow. Try a very low oven—250º or even less—for 3-4 hours. Or on the stovetop over the lowest flame you can manage. Or in a slow cooker overnight. 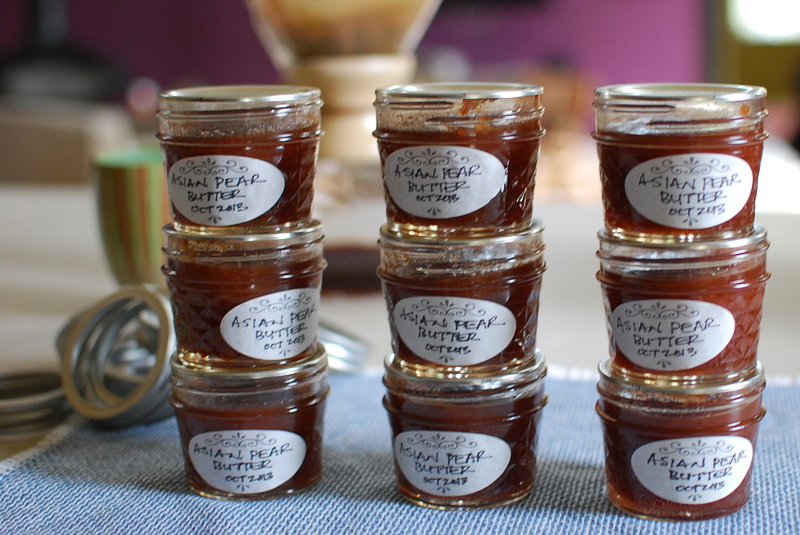 Whichever way you go—and with whatever fruit you use (I’ve done apples, peaches, blueberries, cherries, rhubarb, and now Asian pears)—know that there’s one way that “slow” doesn’t apply to fruit butters. Even though the added sugar gives, say, apple butter, a longer shelf life than applesauce, butters generally have way less preservative sweetener than jams or jellies, so once you open a jar, try to finish it off within 6 months or so. Adapted from my mom’s apple butter recipe, which I think is probably from “Aunt” Harriet Ross, who, with her husband, Arthur, tended a huge garden behind their home near the Southern Illinois University. If you thought Chinese Long Beans were a recent, artisan-fad thing, think again. Art was growing them in the late ’60s. 1. Wash the pears and cut them into like-sized chunks. If you have a food mill or chinois (or even a potato ricer), there’s no need to peel the pears first. In fact, it’s better if you don’t, since the skins and seeds have natural pectin that’ll help your spread achieve a firmer set. If you don’t have a mill, though, you’ll probably want to peel and core everything first. Using a food mill lets you skip the coring and peeling. In fact, the skins help set the preserves. 2. Load the pears into a large pot. Add the water and lemon juice, then the star anise (or spice bundle) and ginger. Simmer, covered, for about a half an hour, until the pears are good and soft. Next time, remind me to buy bigger lemons. It took the whole bag to get one cup of juice. Cloves, allspice berries, and fennel seed subbed for star anise, which got tossed in last week’s spice-drawer purge. 3. Remove the pot from heat. Fish out and discard the star anise/spice bundle. Position your food mill or chinois over a large bowl (if you can set up near the sink or compost bucket, do so). Scoop a few ladles of the pear solids into the mill, and press them through. Discard the solids (skins, seeds, etc.) and repeat with the rest of the pear chunks. Pour any liquid remaining in the pot through, too. If you’re mill-less, you cored and peeled ahead of time, so just smash everything up at this point with a potato masher or an immersion blender. Use a food mill to separate the pears’ seeds and skins from the flesh. 4. Rinse out the original pot (there’s probably a yucky ring from the skins). Measure the purée and then put it back in the pot. Add one-third as much sugar as you have purée. I had 7-1/2 cups of fruit, so I added 2-1/2 cups of organic sugar. Sprinkle in the cardamom, nutmeg, and cinnamon. Stir to combine. Now’s a good time, before you get cooking, to put a small plate in the freezer. I use a 3:1 ratio of fruit:sugar. If you like it sweeter, use more. 5. Cook over low heat until the purée is very thick and and the sugars have caramelized dark brown. Stir frequently so it doesn’t scorch. When you think it’s close, taste and adjust the spices, then test the consistency by dripping a little of the spread onto that plate you tucked into the freezer. Wait 10 seconds, and tip the plate. If it’s not runny, you’re done. My Asian pears must’ve been particularly juicy, because this step took a ridiculously long time—seriously, nearly seven hours of bubbling—way longer than apple butter usually takes. Use the plate test—or the toast test—to see if it’s done. 6. 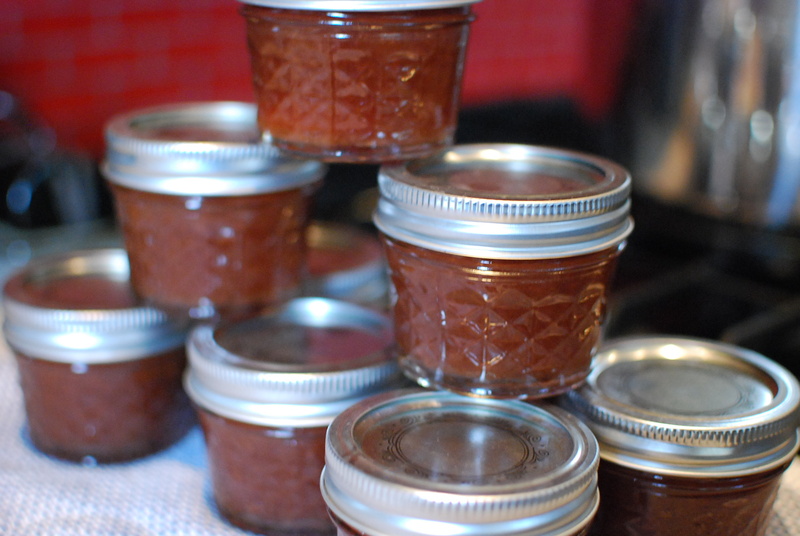 Ladle the preserves into sterilized jars and either cool before you refrigerate, or make shelf-stable by canning them. 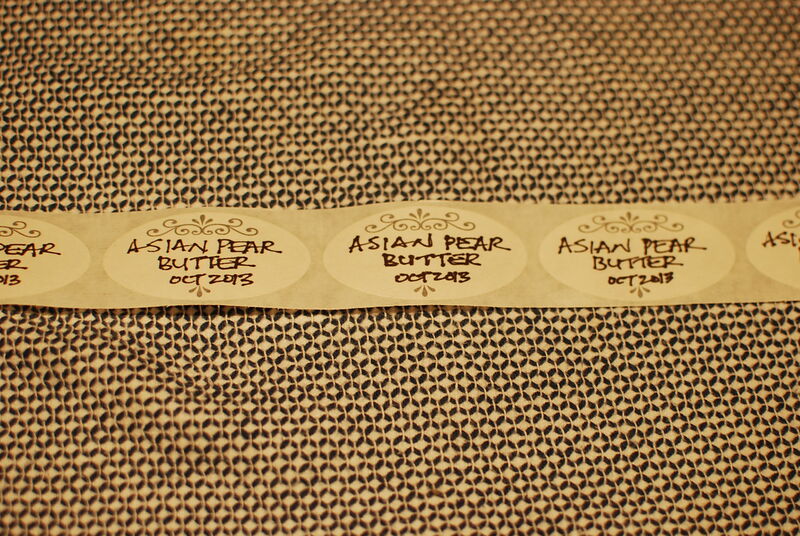 I ended up with 10 quarter-pint jars of pear butter. I processed 9 of them in a boiling canner bath for 15 minutes, and put the 10th in the fridge for more immediate access. Start to finish, the process took nearly 9 hours. The wait was well worth it. But next time, I’ll use a slow cooker so I’m not tethered to the stove and a wooden spoon all day. *** EDIT *** I’ve recently bumped up my processing time to 20 minutes to stay in line with the National Center for Home Food Preservation’s guidelines. Over the years, I’ve never had an issue with any jar of Asian Pear preserves, since I add plenty of lemon juice to balance out their low acidity, but the extra five minutes in the canner couldn’t hurt. How nice will that be to open during our first snow storm? ENJOY! Thanks, D. Looking forward to that first snow. I’m thinking a good, strong dollop on some steel-cut oats. Thanks for reading–and thanks for your comment, Lisa. I believe the recipe’s big slug of lemon juice provides enough acidity here, but if you want to be extra cautious, you could switch to bottled juice, which has a more consistent level than fresh. Or keep everything in the refrigerator. And obviously, toss any stored jar that has a bulging lid or whose contents smell or look funky upon opening. I’ve made at least one batch of this recipe for 4 years running. I usually put it in smaller jars, and I’ve never run into an issue. But I sure do understand and appreciate your caution.